I'm a huge Calvin & Hobbes fan. There was not a funnier, more insightful, or more expressively illustrated comic strip out there, and I took Bill Watterson's retirement pretty hard--harder, perhaps, than might be considered healthy. In any case, his work evolved over time, with a more serious and biting edge revealing itself as the years went by. Despite that, it stayed funny and fresh because it was so effective as a poignant satire on the sad state of current affairs. And as the strip's final days neared, I think Watterson made an effort to cut through his own cynicism to try to find (or re-see?) what was still good and right and beautiful in this world again. I suspect, then, the titles of his final two volumes of original work were no accident: "There's Treasure Everywhere" and "It's a Magical World". I'm reminded of this as I reflect upon my many visits to this extraordinary 207-foot-tall beast of a cataract. The delightful trail winds first through second-growth forest peppered with Pacific dogwood (in resplendent bloom on this occasion) before ambling creekside through towering old-growth Douglas fir, western hemlock, and western red cedar. Below shoulder level, the eye is treated to green vanilla leaf, wood sorrel, large false Solomon's seal, star Solomon's seal, and dark woods violet, just to name a few. The last time I was here it was fairly early in the morning, and I managed to catch a wonderful sunburst coming through the trees (see "Glimmer" and "Hope"). On this occasion, though, I tempered my expectations considerably: We'd gotten off to a late start, the afternoon sun was bright and unmerciful, and Falls Creek looked to be raging in full flood--not exactly great waterfall-shooting conditions right there. But I was wrong, and it started with seeing an all-white fairy slipper orchid for the first time (blurry iPhone pic). Then, after spending most of my time near the middle tier of the falls (the upper tier as it appears here), I came back down to the lower tier and snapped a few shots. 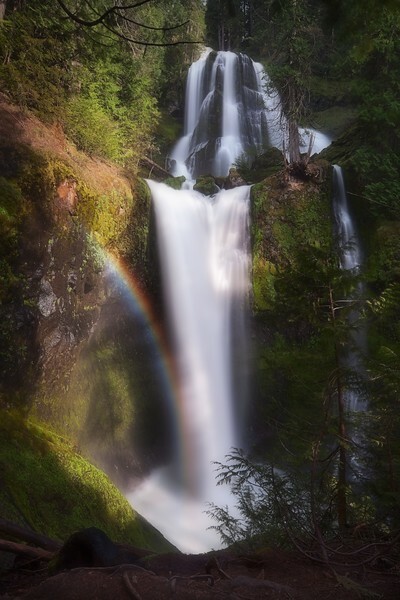 After packing up my gear and preparing to leave, I looked back and saw that a rainbow had taken up position beside the lower tier of the falls while the sun, beginning its descent towards the horizon in earnest, cast interesting spotlights and tree shadows on the falls and rainbow. I quickly set the camera up again and fired away. This rainbow phenomenon probably happens a lot, and I've probably walked past other white fairy slippers and never noticed them. We were the second-to-last party to leave the falls this day, and perhaps that last photographer bore witness to something even more spectacular himself. Who knows? But I suspect magic and little miracles happen everyday--the only questions are, are we there to see them? And when we are, are our senses open and attuned enough to take notice?